Behind UP’s curricular reforms – Bombard the Headquarters! Last March 20, the University of the Philippines Diliman approved in a controversial special meeting of its University Council the reduction of its General Education (GE) program—a move that has spawned protests from UP students, faculty, and academic employees. This follows the adoption of the “reforms” in other UP campuses since last year, with UP Diliman being the last in the UP system to do so. From 45 GE units, each college will be free to require anywhere from 45 to a minimum of 21 units. 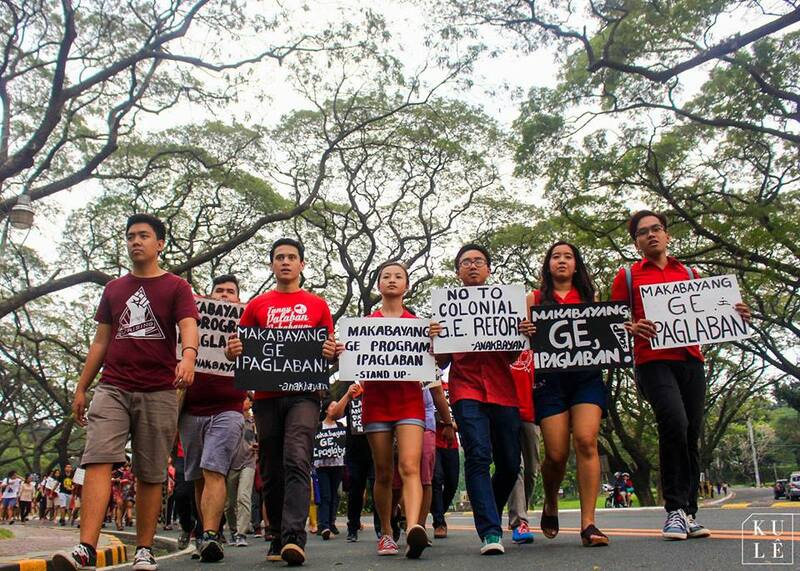 The reduction of GE units is not an isolated incident relevant only to the university’s constituents. These curricular reforms are part of the wider neoliberal agenda that seeks to further align the education system to the needs of the global market. From a curriculum with strictly prescribed courses to supposedly give students a broad perspective to engage with issues and realities outside their own field of specialization, the GE program has undergone several shifts. In 2001, for instance, UP Diliman toyed with an explicitly “free market” model where students chose whichever GE subject they wished. According to the group Contend (Congress of Teachers for Nationalism and Democracy), the latest GE reforms are part of a mad rush to further meet the demands of the “internationalization” of higher education and make it complement the K-to-12 program. These curricular reforms, Contend asserts, are but one manifestation of the neoliberal dogma being pushed by multilateral institutions like the International Monetary Fund-World Bank. “They want efficient robots in the workforce,” said Prof. Gerry Lanuza of Contend. Needless to say, graduates are not required any sense of Filipino culture, history, or even of putting science in the service of the Filipino people. As UP Diliman student leader Ben Te eloquently puts it: “There is no art or science in neoliberalism. Only profit.” By neoliberalism, of course, we mean the “free market” doctrine legitimizing policies that transform public services like education into handmaidens of private profit. This neoliberal framework is no mere buzzword; it is concretely manifested in the restructuring of the university to become nothing more than an assembly line for the mass production of a large reserve of semiskilled and skilled laborers who will compete for lower wages in the world labor market. By adopting these curricular reforms, the university is only reaffirming its original purpose as a training ground for bureaucrats and technocrats manning the US colonial regime when it was founded as the American University of the Philippines in 1908. Indeed, according to Kabataan Partylist Rep. Sarah Elago, these curricular reforms cannot be separated from the Duterte administration’s neoliberal economics that gives away the country’s natural and human resources to transnational corporations on a golden platter. They are, Elago says, but one face of President Duterte’s continuation of the past administration’s programs of unbridled commercialization of education and its further restructuring into a supplier of a “globally competitive” workforce for export. This kind of education can provide an antidote to what has long been diagnosed as the “miseducation of the Filipino masses,” which has divorced our educated youth from the conditions and struggles of workers, peasants, national minorities and other toiling people. Ultimately, only by equipping our generation with the critical faculty to critique exploitative and oppressive social structures can it navigate a milieu marked by the empty rhetoric of change, the proliferation of fake news, and spectacles meant to prop up a rotten ruling order. Until then, we will in the name of marketability continue to produce graduates who meekly accept injustice as unchangeable. Previous 1,328 contractual workers missing?